Use our in-depth search tool to find delicious recipes that fit your needs. FORT LEE , Va. – Turkey and dressing, giblet gravy, cranberry sauce and pumpkin pie are the traditional “must haves” for any Thanksgiving celebration. 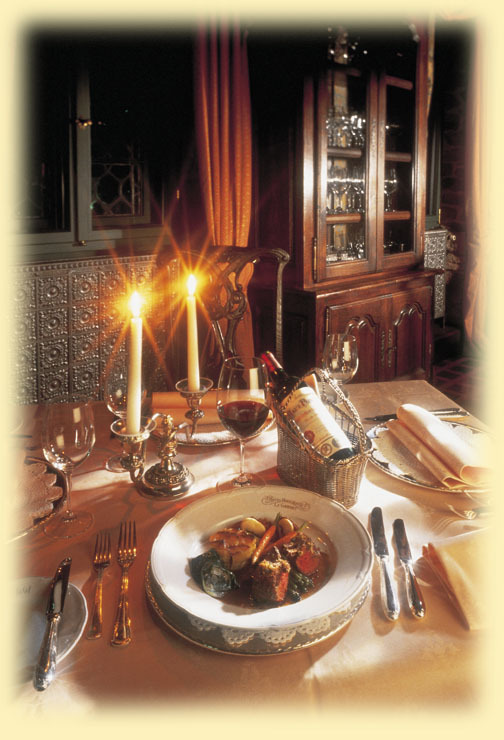 But, it’s the side dishes, special salads and additional dessert choices served alongside that allow families to personalize the menu into unique tradition. Some of those dishes might have been a mother’s or grandmother’s specialty that was adjusted to suit your family’s taste. For example, have you ever made Sweet Potato Balls? It’s a mixture of cooked sweet potato with butter and brown sugar folded in, heaping spoonfuls of which are formed around a full-size marshmallow, then rolled in coarsely crumbled corn flakes and baked in a hot oven just until the exterior is nice and crisp. How about Cheesy Potatoes – cooked cubed potatoes set to swim in a smooth Velveeta cheese sauce, then topped with crumbled cheese crackers and baked until golden? If you’re a big fan of the green bean casserole topped with French fried onions, you might enjoy a similar dish made with frozen cauliflower, carrots, and broccoli bathed in a mushroom soup and sour cream sauce, then topped with cheddar cheese and French fried onions. Finally, cranberry sauce from a can will do, if you just can’t do any better, but I’ll bet you’d love a jellied cranberry salad that uses a can of whole cranberry sauce, some chopped celery and walnuts, a package of gelatin, and that’s it. It’s quick and easy, and the result is “to-die-for” good! Actually, all these recipes fall into that same category of “easy, but just can’t beat it – delicious!” They all came from Defense Commissary Agency patrons and will be posted in Kay’s Kitchen on DeCA’s Web site at www.commissaries.com. When Thanksgiving rolls around, no one will be short of good recipes to serve thanks to these contributions! Recipes for the Web site are still being accepted. Send them in the same format found on the site – recipe name, ingredients list, and directions listed numerically. Make sure they are clear, complete, and written in easily understandable terms. Send your recipes to: kay.blakley@deca.mil. To start the ball rolling here is a must have recipe for my house for Five-Cup Salad. Make some up and don’t forget to share your Thanksgiving recipes with all of us. Cover and chill several hours or overnight and serve. · ● Keep a list of favorite foods and meals on the refrigerator to help in planning meals and snacks. · ● Make the meal plan serve as a shopping list and weekly menu. Include your children when shopping at the commissary for the foods on the meal plan. · ● Teach children about budgeting money for food. They can learn to plan the menu around your budget. · ● Commit to eating together as schedules allow. Aim for at least one night a week. For more information on family meals or other nutrition topics, go to www.commissaries.com and visit the DeCA Dietitian forum. You can post your questions there or access other helpful information in The Dietitian’s Voice archive. Eating a small piece of dark chocolate with less than 30 calories seems to lower blood pressure, according to a recent study published in the Journal of the American Medical Association. Dark chocolate contains flavonoids and antioxidants, which relax blood vessels and protect against free radicals that contribute to heart disease. Look for dark chocolate with at least 70 percent cocoa content. Identify the type of fat used to make the dark chocolate and choose one that is made with cocoa butter, which has a neutral effect on cho les terol levels in your body. Very dark chocolate may be somewhat bitter so you may have to try different ones to find one you like. A word of caution: Chocolate is high in fat and calories. A 3½-ounce dark chocolate bar has about 500 calories, whereas a medium apple has about 60 calories. Portion control is the key to getting the heart-healthy benefit of dark chocolate without getting too many calories. For more information on chocolate or any nutritional topic, visit “Ask the DeCA Dietitian” at commissaries.com-dietitian, an online forum where you can post a question or comment and get quick feedback from DeCA Dietitian Maj. Karen Fauber. FORT LEE , Va. – Are you a shrimp lover? Odds are pretty good you’ll answer in the affirmative, since shrimp is the No. 2 selling seafood in America , outranked only by canned tuna. All commissaries carry frozen shrimp and some may even offer it fresh. Although, “fresh” might actually mean previously frozen and recently thawed. This practice applies to all retailers who sell fish, not just to commissaries. About the only way you can truly buy it fresh is if you meet the shrimp boat as it pulls into the dock. Shrimp is such a popular item it has become an international commodity, and much of what we eat in America is imported from all over the world. It almost has to be frozen to survive the journey to your commissary in good shape. So what kind of quality indicators do you look for, if it comes from everywhere? Avoid shrimp with black spots on their shells, which may be a sign of spoilage. The exception to this rule is a species called black tiger shrimp, a commonly sold shrimp which has a distinctive gray shell with black, red, or yellow feelers. Also, avoid shrimp with dry spots, which may be an indicator of freezer burn. Shrimp freezes beautifully, but once thawed, it is highly perishable. If you purchase it frozen, keep it frozen until the day before you plan to cook it. Thaw in the refrigerator, or under cold running water. If purchased thawed or fresh, keep it as cold as possible and plan to cook it the following day. What’s the best cooking method for shrimp? Any method you choose. It can be baked, broiled, steamed, breaded and fried, or boiled with excellent results. But, one of the quickest and easiest methods is on the grill. All it takes is a fast four minutes on the fire and you’re ready to enjoy. Follow the steps in this easy but delicious recipe, if it’s your first time grilling shrimp. Once you experience how easy it is, you’ll have the confidence to branch out in whatever direction tickles your taste buds. Check out your commissary’s shrimp selection. Then savor the savings – 30 percent or more – as much as you savor the flavor, once you’ve thrown those shrimp on the barbie. For more Kay’s Kitchen recipes, visit DeCA on the Web at www.commissaries.com. 1. Prepare a medium-hot fire (hardwood charcoal works best); clean the grate, and place it as close to the fire as possible. 2. Combine all the sauce ingredients together in a large serving bowl, and set aside. 3. Place the shrimp in a separate bowl, drizzle with 2 tablespoons olive oil and toss to coat well. 4. Place the shrimp on the grill -- thread shrimp on skewers, if desired, or just place it on the grate carefully, so it doesn’t fall through. Cook about 2 minutes on each side. Turn the shrimp after the first side becomes pink, and repeat the process for the second side. Remove shrimp from the grill, add it to the sauce mixture, toss gently, and serve immediately. FORT LEE , Va. – Bouquets of roses make an appropriate fuss, but this Mother’s Day, just make mine asparagus. Sounds ridiculous at first blush, but dig a little deeper, and you’ll see this elegant looking vegetable, prized for its delicious flavor, is tailor made for moms. If mom is watching her figure, a generous five-spear serving of asparagus will only cost her about 25 calories. If she’s of child-bearing age or perhaps pregnant right now, she’ll get a super dose of folic acid, a B vitamin important for prevention of birth defects, and a significant amount of the antioxidant glutathione, which is linked to cancer prevention. Asparagus is also a good source for vitamin C, thiamin, and vitamin B6. Does mom ever get a case of puffy ankles or swollen feet? Well, bring out the asparagus! It acts as a natural diuretic, efficiently flushing the excess fluid from those uncomfortably enlarged tissues. Once the diuretic effect kicks in, don’t be alarmed if the urine takes on an usual odor. Asparagus contains a sulfur compound (also present in onions and garlic) that releases this scent once it is broken down in the digestive tract. Not everybody has this experience – apparently your genetic makeup determines whether or not your body can break down the substance. At any rate, it’s nothing to worry about. Asparagus is one of the first fresh vegetables to come into season the minute spring arrives. If you’re stationed in California or Washington State your commissary may have fresh, locally grown spears available as early as February, with the season in full swing from April through May. The growing season for the Midwest and East starts a little later, but extends through July. If you happen to be stationed in Germany , it’s almost impossible to miss asparagus season. From late April to the end of June nearly every restaurant you see will have a sign posted heralding their spargel (asparagus) menu of the day, and many cities and villages hold spargel festivals. Germans love white asparagus, which is basically the same as green, except that the developing shoots of white asparagus have been protected from exposure to direct sunlight. The other big difference is its flavor – very smooth and delicate, but very deep and rich. European commissaries routinely have both green and white asparagus on hand, but since the white variety is not yet widely available in the states, your stateside commissaries may not. If your commissary doesn’t have it, ask your produce manager if it’s possible to get it. Whether white or green, choose the freshest looking spears you can find – ones with smooth, tender skin, compact, tightly closed, pointed tips, and cut ends that are not overly dry. Choose thick or thin spears depending on how you plan to cook them. Thin asparagus (no bigger than the size of your little finger) are best steamed, boiled, sautéed, stir-fried, or microwaved, while thicker spears are better suited for roasting or grilling. Once purchased, get the asparagus home and refrigerated as soon as possible, as spear toughening occurs rapidly at room temperature. To keep the spears crisp and fresh, store them standing upright in a cup, a plastic glass or similar container. Add about an inch of water to the bottom of the container, and cover the spears, from the tips down, with an unsealed plastic bag. If this is not possible, wrap the cut ends with a damp paper towel and store in a closed plastic bag. For best results, try to use the asparagus on the day of purchase or the next day. If the asparagus is very fresh when purchased and carefully stored it may keep for three to five days in the refrigerator. But then again, it may not, so using it quickly is always best. When you’re ready to cook, rinse the asparagus well with cold water, then snap off the tough cut ends in the following manner. Use one hand to grasp a spear at the base (cut end) and hold it upright, gently bend the spear with the other hand placed a couple of inches higher up the stalk toward the tip. The spear will snap at the point where it begins to toughen, usually about an inch, or so, from the cut end. If the spear above the break appears to be very fibrous, use a vegetable peeler to remove the skin up to, but stopping before, the tip. To Boil: Use a skillet, wide enough to accommodate the asparagus spears in a single layer, and deep enough to cover them with water. Bring the water to a boil (add a teaspoon or two of salt to the water, if desired.) Once the water is boiling rapidly, gently add the asparagus, and bring quickly to a second boil. The cooking time required will vary from about 5 minutes for thin spears to 10 minutes for thick spears. Watch the pot carefully, and the minute a spear turns bright green, you will know it is tender-crisp, and just about perfect. Use a slotted spoon or tongs to remove spears to a plate as they reach this state of doneness. Be sure to drain any accumulated water from the plate before serving. To Microwave: Place one pound thin to medium trimmed spears in a 2-quart baking dish. Add 2 tablespoons lightly salted water. Cover and cook on high until tender-crisp, 4 to 9 minutes, rearranging spears (moving those in the center to the outside, and those on the outside toward the center) every 3 minutes. Let stand, covered, for 2 minutes. To Grill: Use paper towels to pat the rinsed and trimmed spears completely dry, then generously brush with oil. Place the spears crosswise on the grill grate, so they don’t fall through, over a slow wood or charcoal fire. Turn the spears frequently until you can smell the asparagus and one tastes cooked through. Cooked asparagus can be served hot or at room temperature, and can be enjoyed just as it is, which is the lowest calorie option, drizzled with melted butter, seasoned oil or basic vinaigrette dressing, or topped with classic Hollandaise Sauce, either made from scratch or from one of the packaged mixes your commissary carries. Make asparagus part of your Mother’s Day meal, and chances are, you’ll be re-creating that part of the celebration again and again throughout the year. Enjoy! Happy Mother’s Day, and I’ll see you at the commissary! FORT LEE , Va. – There’s hardly a dish more traditionally German than beef rouladen – perfectly seasoned, totally tender rolls of stuffed beef in a luscious brown sauce. 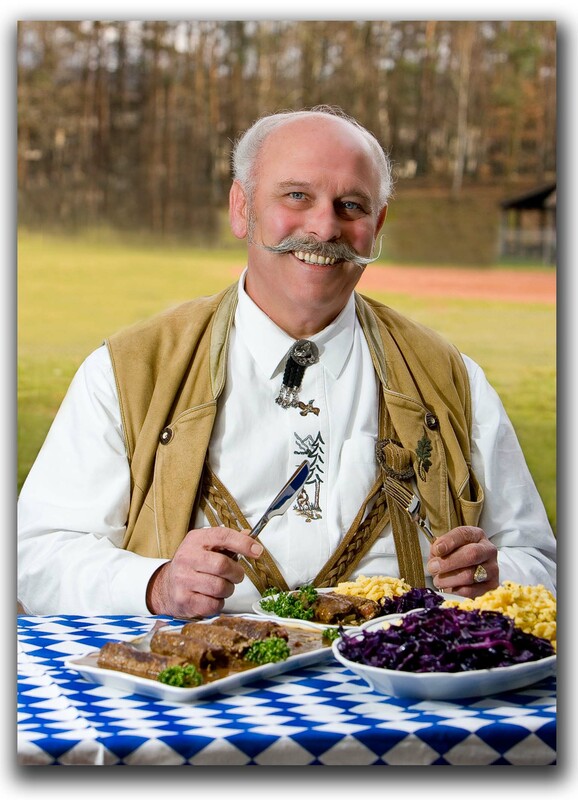 And, there’s hardly anyone more qualified to share the secrets of preparing it than Arno Franke, a master butcher for the Defense Commissary Agency, who also happens to have six years of training as a cook – first in the German army, then as a restaurant hotel chef. Today he travels a circuit of European commissaries making sure each local store’s meat department is serving its customers just right. If you shop one of the European commissaries, you will find a cut specifically labeled “top-round for rouladen” in the fresh meat case. If you’re located elsewhere, but your commissary has an in-store butcher, ask for scallops of top round cut one-quarter-inch thick. Chances are fairly good the butcher will know exactly what you need. Especially when you tell him you are making rouladen. Don’t bother trying this at a retail grocer outside the gate. Unless you happen to live in an area heavily populated with German-Americans, they will have no clue what you’re talking about. They don’t have the international flair and well-traveled clientele that we have. Just one more reason that shopping the commissary is always worth the trip! Serve beef rouladen with braised red cabbage and spätzle or creamy mashed potatoes. Sauté bacon and ½ cup onion in medium skillet over moderate heat until bacon is crisp and onion is tender, but not browned, about 8 to 10 minutes. Mix in the parsley, remove from heat and stir in the pickle. Let cool while you prepare the beef scallops. Heat the butter and oil in a 12-inch skillet. Add beef rolls and brown on all sides, slowly, so as not to burn them. Transfer rolls to a plate and cover with foil to keep warm. Smooth the puree back into the skillet, stir in the tomato paste, half-and-half and evaporated milk. Adjust the temperature so the mixture simmers gently. Keep the heat low – allowing the sauce to boil may cause it to curdle. FORT LEE, Va. – A backyard cookout for a family gathering is about as American as you can get and a great way to beat the summertime blues. If you’re searching for something a little snazzier than humdrum burgers and dogs, you’re in the right place. Why not try preparing succulent, seasoned-to-perfection, fall-off-the-bone-tender barbecued ribs? Priced-right ingredients from your commissary, along with some “how-to” tips from yours truly, and a trust worthy recipe are sure to earn you the title of “Pit Master Extraordinaire” even if you’ve never grilled ribs before! The Memphis Barbecue recipe calls for spareribs, which are from the side or underbelly of the pig. To avoid having to trim the rack at home, look for spareribs called “St. Louis” style, which means the brisket bone and breast meat have been trimmed off to produce a narrower, more rectangular rack. Spareribs have a marvelous meaty flavor and, since they are not as lean as the more popular baby back ribs, they do very well on the grill. Baby backs, cut from the loin section or the back of the pig, will also work fine in this recipe. They are smaller, easier to eat, and very tender, but because they are leaner, they can dry out easily during a long slow cook. If you choose to use baby backs, be sure to mop them generously, and check for doneness after two and a half to three hours. By the way, if you normally think of “mop” only in terms of something done to a dirty floor, just keep reading. In this case, mop refers to a kind of basting, done with a cooking tool resembling a rag mop. All will be clarified as you read through the recipe – I promise. Plan on about one pound per person for either type of ribs. Don’t be put off by the length of the recipe. Even though it might look complicated at first glance, believe me, there is nothing difficult about it. All it requires is a five-minute stretch of your full attention, at the appointed time, over a span of three to four hours. Let your guests bring all the side dishes and spend that time visiting and working up an appetite from the scrumptious aroma you’ll be creating in your own backyard. These ribs are moderately spicy – adjust the cayenne and Tabasco, as you wish. To reheat leftovers, place ribs in an ovenproof dish, add a few tablespoons water, cover with foil, and place in a 250-degree oven for 20 to 30 minutes. 2 full racks St. Louis cut, pork spareribs, 2 ½ to 3 pounds each, trimmed of excess large pieces of fat, membrane removed, and patted dry. About an hour before cooking time, mix the spice rub ingredients together in a small bowl; stir cider and vinegar together in a small saucepan and set aside. Place wood chips in a bowl with enough water to cover, and set aside. To ready the ribs for the grill, trim away any large pieces of fat; turn the racks rib-side-up and remove the thin membrane lining that sits atop the ribs. Starting at one end of the rack, loosen the edge of the membrane with the tip of a paring knife, or the slender tip of a spoon handle. Using a folded paper towel to increase your grip, grab the membrane and slowly pull toward the opposite end of the rack. It should come off in one piece. Once you see the membrane and feel how very tough it is, you’ll understand how important this step is to ensuring tender and easily edible ribs. Reserve 2 tablespoons plus 1 teaspoon spice rub for later use, then using your fingers, work remaining rub into both sides of rib racks. Use the entire amount of spice mixture, rubbing it in firmly and packing it on generously. Let ribs stand at room temperature until ready to cook. Light about 45 charcoal briquettes, using the smallest amount of lighter fluid possible to get the fire started. You don’t want your ribs to have a faint taste of lighter fluid! When coals are covered with thin layer of gray ash, about 20 minutes, stack them two to three briquettes deep on one side of the grill. Set cooking grate in place, open top and bottom vents halfway, cover grill and heat for five minutes. Remove cover and scrape cooking grate clean with a wire brush; drain wood chips; position ribs on cool side of the cooking grate, as far away from the coals as possible. Drop ¼ cup wood chips through the grate onto the coals; cover grill, positioning lid so that vents are opposite coals to draw smoke through the grill and over the ribs. Bring the mop mixture to a simmer, on the stove; cover and keep warm. Every 30 minutes: Add ½ cup wood chips to the coals, and turn the racks, switching their position from closest to the fire to furthest from the fire, and rotating them 180 degrees. Every hour: Add 12 unlit briquettes to the fire, sliding the top and bottom vents completely open after the first addition. Mopping: After the first hour, baste the ribs (when turning them) with the warm mop. Use a pastry brush to apply the mop if you don’t have a barbecue mop. Ribs are done when the meat starts to recede from the tips of the bones and has a rosy glow on the exterior, three to four hours. Before removing ribs from the grill, sprinkle each rack with 1 tablespoon reserved spice rub. One at a time, place each rack of ribs on grate directly over the coals, cooking about 30 seconds on each side, then transfer to cutting board. If you’re confident they are tender, tent the ribs with aluminum foil and let them rest for 20 to 30 minutes. To be absolutely certain they are tender; seal them tightly in foil for a 30-minute rest. While ribs rest, add remaining 1 teaspoon spice rub to remaining mop and simmer, uncovered, until liquid is reduced to about 2 cups. Add Tabasco and more salt and pepper, if desired. Slice ribs between bones and serve with sauce on the side. Meat loaf is a great meal because it takes very little time to prepare and it can be made in large quantities and stored in the refrigerator or freezer and warmed up in the microwave for a very quick hot meal. It is also very inexpensive to make and good for you. In a large brown, lightly beat the egg. Add 2 tablespoons of ketchup, mustard, bread crumbs, dry soup mix, salt and pepper. Crumble beef over mixture and mix well. Shape in a shallow 1-qt microwave-safe dish; cover with waxed paper. Microwave on high for 11-12 minutes or until meat is no longer pink, rotating a half turn once; drain. In a shallow bowl, combine the sugars, vinegar and remaining ketchup; drizzle over meat loaf. Cover and microwave on high for 3-5 minutes Let stand 10 minutes. Because most of their nutrients are directly beneath the skin, don't peel new potatoes. Just scrub and cook. Preheat the oven to 400°F. 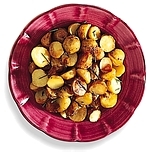 In a large bowl, combine the potatoes with the garlic, oil, and rosemary, if using. Transfer to a roasting pan and roast about 45 minutes or until golden and cooked through. Look for smooth-skinned solid potatoes. Avoid potatoes that are blemished or sprouting and those with a green color, which will taste bitter. In selecting mushrooms, look for firm, dry skin. Colors vary from white to brown. Preheat broiler. Arrange mushrooms, stem side down, on rack over a broiler pan. Brush generously with oil and broil until slightly soft. Transfer to a bowl and stir in remaining ingredients. Marinate at least 2 hours. Preheat the broiler. Line a broiling pan or shallow baking pan with the rock salt or a layer of crushed foil. Cut each slice of bacon in half crosswise, then lengthwise. In a small bowl, mix the parsley with the garlic. To prepare mushrooms, gently clean with a damp paper towel or wash under cold water and pat dry. Trim or remove stems. Since colonial days, a punch of champagne and fruit has been a favorite for "very proper receptions." To make the strawberry ice cubes: At least 6 hours before party time, wash the berries. Place 1 small, pretty berry (with leafy hulls attached) in each compartment of 2 standard-size ice cube trays, then fill with water and freeze. To prepare the punch: Remove the hulls from the remaining berries and place them in a food processor. Process for 2 minutes or until pureed, then transfer to a punch bowl. Stir in the pineapple juice, lemon juice, and sugar; cover and refrigerate. Just before serving, pour in the champagne and float the strawberry ice cubes on top. Many grandmothers made their own cream cheese from milk and rennet. Today, you can get that rich old-fashioned taste, with less fat, by making yogurt cheese. Then, just stir in fresh herbs and spread on crackers. Line a sieve with 100 percent cotton cheesecloth, coffee filter, or a white paper towel and place over a bowl. Spoon in the yogurt. Cover and refrigerate for at least 6 hours or until it is cream-cheese consistency. Discard the liquid in bowl. Transfer the yogurt to a small bowl. Stir in the basil, garlic powder, lemon rind, and pepper until well mixed. Serve the spread with an assortment of crackers or party rye or pumpernickel bread. Since colonial days, Maryland has prided itself on serving some of the finest crab cakes in the land, often made from the blue crabs of Chesapeake Bay. In a large bowl, lightly toss the crab with the green onions, parsley, yogurt, lemon juice, garlic, mustard, Old Bay seasoning if you wish, Worcestershire, salt, and red pepper sauce. Stir in 1/4 cup of the bread crumbs. In a small, clean bowl, beat the egg whites with an electric mixer on High until soft peaks form, then fold into the crab mixture. Form the mixture into 4-inch-round patties, about 1 inch thick. On a piece of wax paper, spread the remaining 3/4 cup of bread crumbs and use to coat each patty. Refrigerate for 1 hour. In a 12-inch nonstick skillet, heat 1 tablespoon of the oil over moderately high heat. Cook the crab cakes for 3 minutes on each side or until brown, adding the remaining 3 tablespoons of oil as needed. Serve with the lemon slices and tartar sauce. A cooling drink is an essential partner to this hot and spicy nut mix. You can adjust the seasoning to your taste. Preheat the oven to 300°. In a 13- by 9-inch baking pan, place butter; set the pan in the oven to melt the butter. Remove the pan from the oven; add pecans, almonds, peanuts, and Worcestershire sauce to the melted butter. Stir until well mixed. Transfer the warm nuts to a bowl and serve immediately, or let cool and store them at room temperature in an airtight container until ready to serve. If you can chop and stir, then our wonderful Spinach Dip will be a snap to make. It's a tried and true party favorite. In the early 1900s, cheese and crackers were served with coffee after dessert. By the 1950s, cheese had become an appetizer, and nothing was more popular than cheese balls. In a small bowl, with an electric mixer on high, beat the cream cheese, cheddar cheese, Monterey Jack cheese, mayonnaise, and wine until well mixed. Wrap in plastic wrap; shape into a ball. Refrigerate for at least 2 hours (will keep for 2 days). Place the almonds, pecans, and walnuts on separate sheets of wax paper. Unwrap the cheese mixture and divide into thirds. Form each third of cheese mixture into a ball. Carefully roll one ball in the almonds, one ball in the pecans, and one ball in the walnuts, coasting each completely. Rewrap in plastic wrap and refrigerate until time to serve. Serve the cheese balls with an assortment of crackers. For a rich, toasty flavor, bake nuts in a 350° oven for 5 to 10 minutes or until they are golden, stirring occasionally. An irresistible indulgence or a luscious gift for a special occasion, these chocolate truffles will delight your family and friends. Line a large baking sheet with baking parchment or aluminum foil. In the top of a double boiler over low heat, stir 4 ounces of the chocolate until melted. Remove from the heat and beat in the cream and cognac. Blend in the apricots, chopped hazelnuts, ginger, and confectioners sugar. Stir well to combine. Chill the mixture, if necessary, until firm enough to handle. Form into 1-inch balls and set aside on a sheet of wax paper. In the top of a double boiler over low heat, stir the remaining 5 ounces of chocolate until melted. Remove from the heat. Using a fork, dip each truffle into the melted chocolate, allowing any excess to run off. Place the truffles on the prepared baking sheet. Top each with a hazelnut half and chill. When the chocolate has set, the truffles can be stored in an airtight container in the refrigerator for up to 1 month. The key to perfect brittle is adding baking soda. It reacts with the caramelzed sugr to make the candy porous and not too hard-so it's easy to eat. Makes about 1 pound (50 pieces). Butter a large baking sheet; set aside. In a large havey saucepan, combine the sugar, corn syrup, water, and butter. Bring to a boil over moderately high heat, stirring constantly with a wooden spoon to dissolve sugar. (Avoid splashing mixture onton side of the pan.) Boil for 3 minutes. If using a candy thermometer, carefully clip to the side of the pan, making sure the bulb is immersed but not touching the bottom of pan. Stir in peanuts. Cook over moderate heat, stirring constantly, to 300° on candy thermometer, hard-crack stage (10 to 15 minutes). (Using a spoon, drop a small amount of hot mixture into very cold, but not icy, water. It should separate into hard, brittle threads that snap easily.) Watch carefully so mixture does not burn. Remove the pan from heat; remove the thermometer from the saucepan. Immediately stir vanilla and baking soda into hot mixture, stirring constantly until light and foamy. Quickly pour and spread mixture onton prepared baking sheet. With 2 forks, lift and pull candy into 14 x 12-inch rectangle. Pull gently to avoid tearing. Cool completely on wire rack. Break candy into pieces. To store, cover tightly. Grandma used whatever nuts she had on hand, which is how this delicious variation of pecan pie came to be. Hazelnut, macadamia nuts, cashews, or peanuts also work well. Preheat oven to 400°. Line a 9-inch pie plate with pie crust. Trim crust to 1/2 inch beyond edge of pie plate. Fold under extra crust and crimp edge. Line crust with foil and fill with dried beans. Bake for 15 minutes or until light brown. Cool crust on a wire rack for 5 minutes; discard foil. (Save beans for future pastry baking.) Lower oven temperature to 350°. 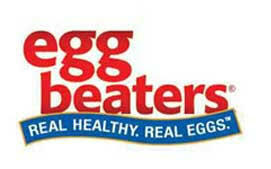 Meanwhile, in a large bowl, using a rotary beater or fork, beat the egg whites and egg just until mixed. Whisk in the maple-flavored syrup, brown sugar, flour, butter, and vanilla just until smooth. Stir in the walnuts. Pour the syrup mixture into baked crust. Bake for 40 to 45 minutes or until a knife inserted in the center comes out clean. (If the edge of the crust seems to be browning too quickly, cover with foil.) Cool on a wire rack for 1 hour. Serve with frozen vanilla yogurt or cover and store in the refrigerator. The four steps to food safety: Clean, separate, cook and chill to protect foods from harmful bacteria, which can ultimately result in foodborne illness. Military food safety inspectors help to make sure foods offered for sale by your commissary are handled and stored according to strict food safety guidelines. Locate some of the best military recipes from Seabook Cooks. Nutrition news, recipe finder and more from Prevention's Healthy ideas. Features Kraft Military Sales promotional, food pyramid, and nutritional food values. Create delicious and nutritious meals. Nutritional links, consumer information, fish/shellfish recipes, and other culinary information. International School of Baking provides cooking tips. Largest recipe database on the Web. Customized grilling instructions, recipes, and outdoor grilling tips. New! Add your favorite Recipe Now! Each entry wins prizes! FORT LEE, Va. – The economy is improving at a snail’s pace, but beef prices are “sizzling” and there is no end in sight. As a result, families on a tight food budget might have to look at their dinner plates and ask, “Where’s the beef?” Military shoppers are not protected from the dramatic increases in beef prices, but double-digit savings over commercial grocery stores gives authorized customers even more reason to shop their commissary meat case. Americans consume a lot of beef and so do military families. Beef sales in commissaries are up 5 percent since 2002. But whether it’s the popularity of those high protein diets, periodic bans on imported beef due to “mad cow” disease scares, or a drought in the Western United States, the bottom line is the highest beef prices in nearly a decade are here to stay – for at least the next six months. “The beef market is based on supply and demand, and when the demand is more than supply, you can expect higher prices,” said Fowler. Fowler suggests families on a tight budget might want to purchase less expensive cuts of beef until the market supply stabilizes. Instead of a boneless rib eye steak, customers might want to try chuck eye steak; instead of beef tenderloin, shoppers might select a top blade steak; and rather than a sirloin tip roast, try a shoulder pot roast. “Shoppers just have to look more carefully at the price per pound they are paying and remember that less tender cuts of meat may require a change in their normal cooking habits,” said Fowler. For more information on beef cuts and how to cook them, check out http://www.beef.org. Commissary beef sales may still be up, but shoppers are also buying more chicken. Chicken is less expensive and the prices have remained more stable than beef, according to Fowler. Pork has also risen in price recently, but the increases are still less dramatic than for beef. The Defense Commissary Agency operates a worldwide chain of nearly 280 commissaries providing groceries to military personnel, retirees and their families in a safe and secure shopping environment. Authorized patrons purchase items at cost plus a 5-percent surcharge, which covers the costs of building new commissaries and modernizing existing ones. Shoppers save an average of more than 30 percent on their purchases compared to commercial prices – savings worth more than $2,400 annually for a family of four. A core military family support element, and a valued part of military pay and benefits, commissaries contribute to family readiness, enhance the quality of life for America’s military and their families, and help recruit and retain the best and brightest men and women to serve their country.